Hunting for food is instinctive in cats, but most indoor cats have their food served to them in a cute little dish, ready for them whenever it occurs to them to eat. No wonder so many indoor cats are overweight. But Catit Design Senses Food Maze at least asks your cat to move a couple of muscles before he gets his kibble or cat treats. 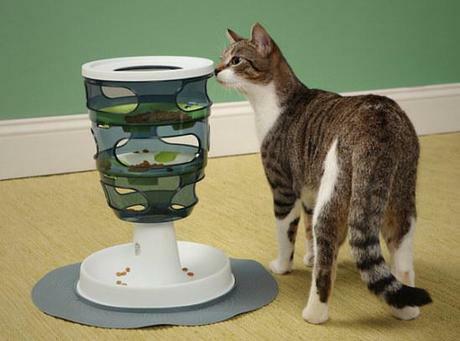 This clever means of feeding your cat requires that he poke the kibble from each of the spiraling discs down to the ground floor pressure mat, where he can eat his meal or treats and get a paw massage as well! This is the third Catit interactive product I've seen in action and it's as impressive as the other two: the Catit Pet Fountain and the Catit Cat Spa. It will keep your cat from over-eating and keep his brain active. And for your quickly bored cat, the interactive Catit Design Senses Food Maze has varying levels of difficulty! Available at ThinkGeek!